« What’s New! What’s Different! Bluetooth Speaker Bottle! To be honest, I never really loved this item. I found it loud, flashy had trouble understanding it. I have now come to love this Rectangle Backlit LED Badge Necklace. I believe there is a time and place for everything. This is a great item when given to all attendees at an event that is being hosted in a darkened area such as a concert, night event or when advertising travel, camp,something flashy or illuminating. It is a great way to advertise the event and your company name and visitor. Come jump on the bandwagon with me. This can also be used to have your VIP stand out. 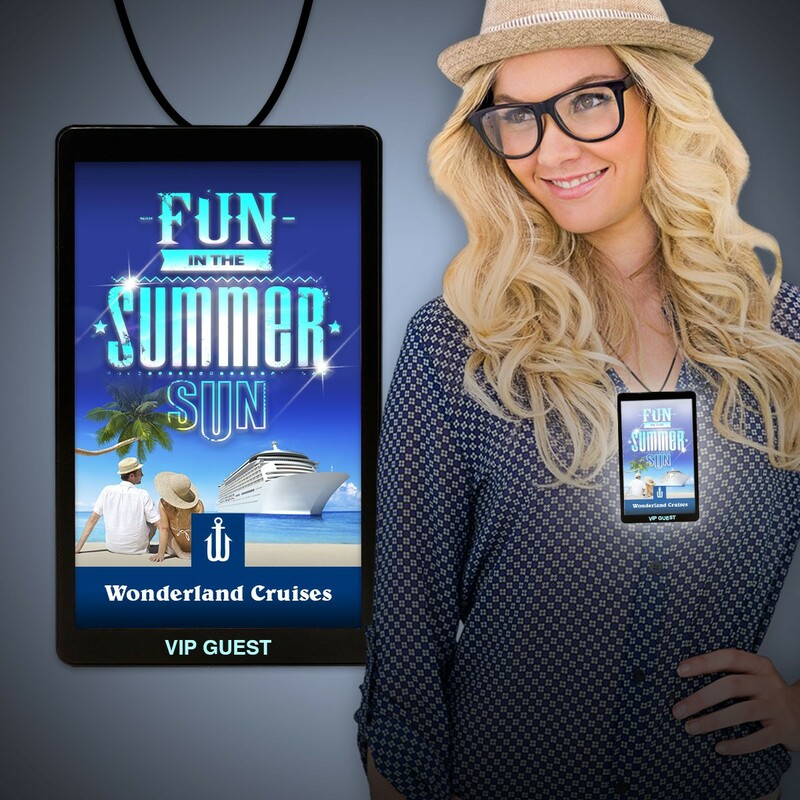 This head turning backlit promotional badge necklace lights up any design for a great way to advertise. One bright white LED illuminates artwork like you wouldn’t believe. Each Badge comes with 3 different light settings; fast flash, slow flash and steady on. 36″ break away lanyard included and attached. This unique bade is designed to hang vertically or horizontally. Above pricing includes 1 – 3 ” x 5″ insert with full color process. For all imprinting add a Set-up fee of $55 (v). We may offer additional locations and up to 4 spot colors, PMS matches acceptable @ $14 (v) per color. For each additional location and for each additional spot color add a Set-up fee of $55 (v) and a running charge of $.25 (v) per color, per location. Imprint Minimum is 200 pcs. Imprint Method: Insert – Full Color Process; Top or bottom of badge – Pad Print.